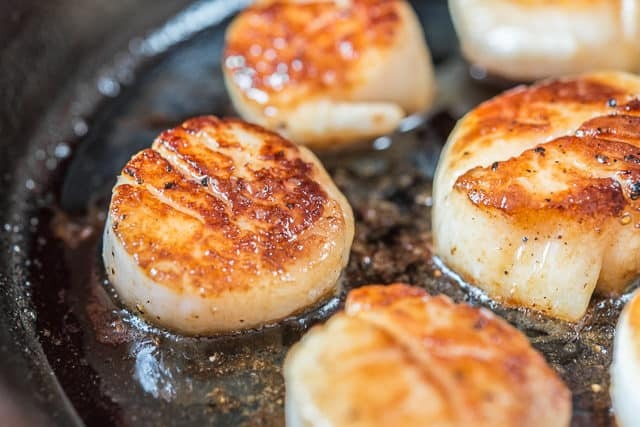 Learn how to make Seared Scallops with a perfectly golden brown crust, just like at the restaurants! 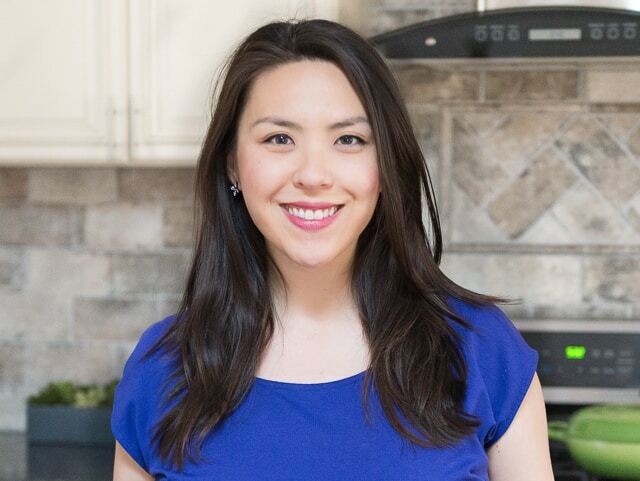 They’re incredibly simple to make at home and much cheaper than dining out. Scallops are on most nice restaurant menus these days, and for good reason. As far as seafood goes, I would take scallops over anything. While I love shrimp, crab, fish, and lobster, seared scallops are the king of my seafood universe! Their mildly sweet flavor and that caramelized crust they get when seared in a super hot pan…oh, swoon. Not to mention, they’re really low-maintenance compared to lobster and crab. What’s funny to me about scallops is a lot of people only order them at restaurants because they’re too intimidated to make them at home. Scallops are one of the easiest things you can make at home. I actually cooked scallops quite a bit during my surgery recovery because they take 10 minutes to make, they’re super filling (it’s like a big ball of protein), and most importantly, they’re mighty delicious. I also love that you just pick them up from the store and don’t have to do any prep with them, aside from seasoning with salt and pepper. So before we get cooking, let’s talk about buying scallops. I’ve noticed more and more grocery stores labeling their scallops as either wet or dry, which I really appreciate because I used to have to ask. A wet scallop has been soaked in a preservative phosphate solution. This makes the scallop absorb more water, and when you cook them, they kind of shrivel a bit and don’t brown as well because of that extra liquid. The phosphate solution also gives the scallop an off flavor, and they’re usually not as fresh. A dry scallop has not been treated with any chemicals additives or solutions. Compared to the wet scallops, they are darker (more of a beige color, whereas the wet scallops are whiter), and they have a more pure flavor. If possible, you always want to buy dry scallops. The first thing you want to do when you’re searing anything is to pat the outside dry with a paper towel. I do this when I make Pan Seared Steaks too. Next grab a skillet, preferably cast-iron. 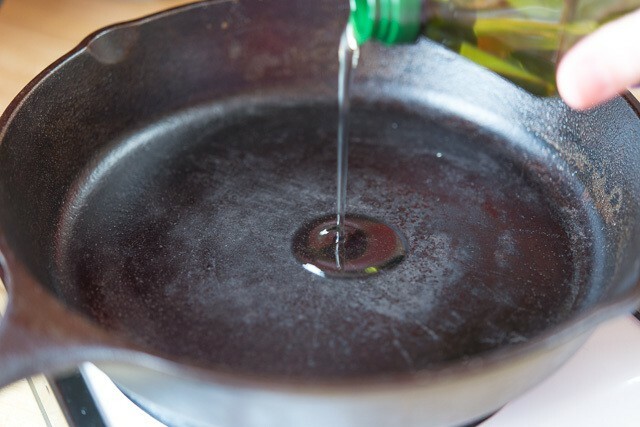 Cast iron pans are my favorite for searing because they retain heat so well and preheat nicely. 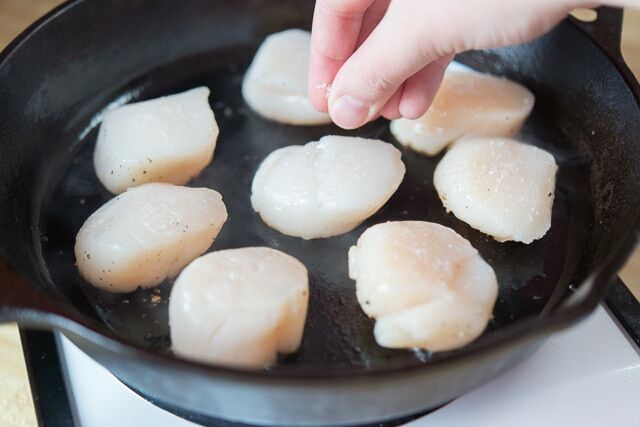 Drop in your scallops, and make sure to give them enough space in the pan so they’re not steaming each other. 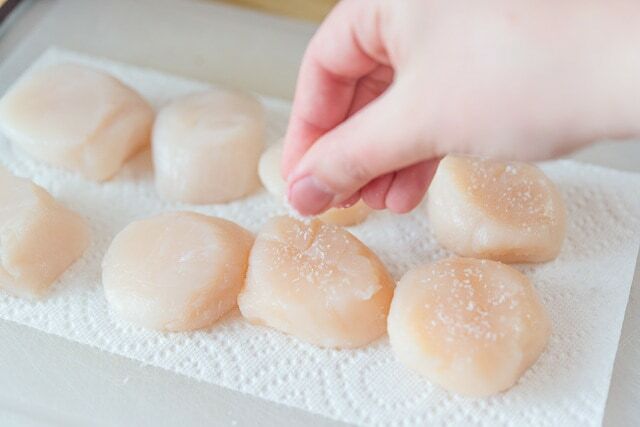 Once the the scallops are done cooking, serve immediately, and make sure to transfer them to another dish for serving. 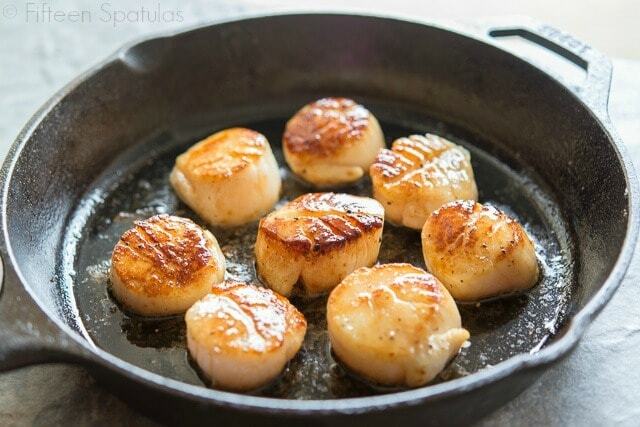 The cast iron retains heat and will continue cooking the scallops unless you take them out. What goes with seared scallops? I like serving them with something light, like a salad. Here is the Salad category of my recipe index for ideas, but the Mexican Corn Salad goes really well in particular, as well as this Arugula Zucchini Salad. I also have a recipe for Seared Scallops with Bacon Jam and Basil, which is a flavorful compliment to the scallops! How long will scallops keep in the fridge? Two days max. When they’re fresh, they have a sweet ocean smell, and when they start to spoil they will take on a stinky fish smell. Can scallops be reheated? Yes, but you have to be careful not to cook them further. Heat until they’re just warm enough to eat. I do this in the microwave at half heat. 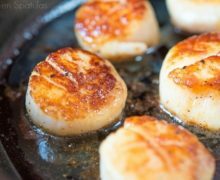 Learn how to make seared scallops with a perfectly golden brown crust, just like at the restaurants! Preheat a cast iron skillet over medium high heat. 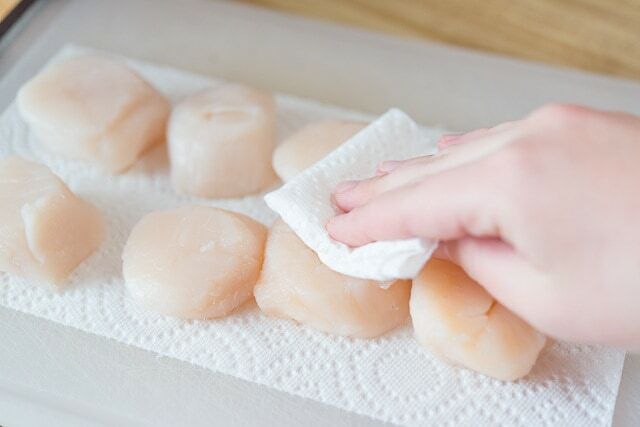 In the meantime, pat the scallops very dry with a paper towel. Sprinkle the sea scallops with salt and pepper, to season. 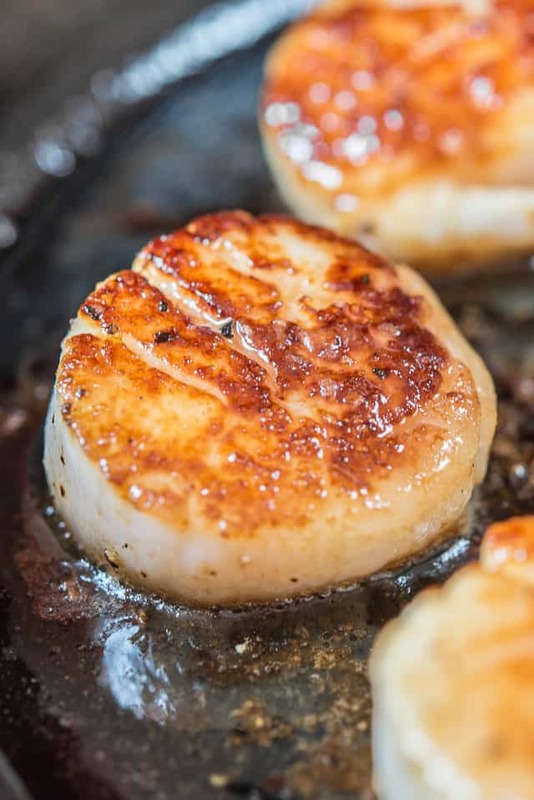 When the pan is hot, add the grapeseed oil, then drop in your scallops, giving them enough room in between so they don’t steam each other. 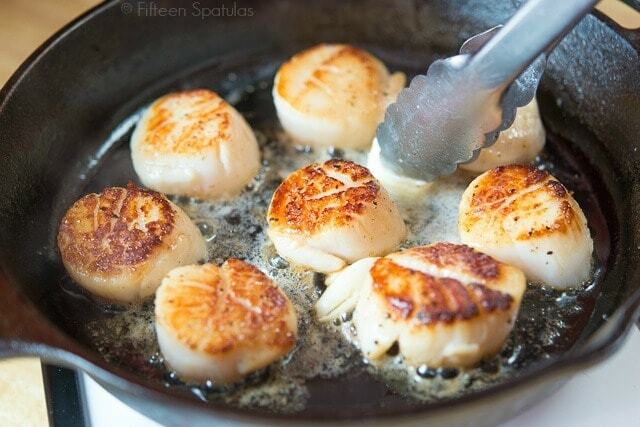 The scallops should make a sizzling noise when you put them in the pan. Cook the scallops for 2 minutes, making sure not to move them or touch them at all. Flip the scallops over with a pair of tongs, and add the butter to the pan. Let the scallops cook for 1 more minute, basting the scallops with the butter. Remove the scallops from the pan and serve! Thank you for telling to buy DRY, I learned the hard way STP changes the taste and extra water is unwanted! Never look up stuff to cook – this time I did – turned out GREAT just like you said. Thank you!!! Cooked asparagus to go with and nearly cooked them the exact same way as the scallops!